Supernatural ending? no season six? After four seasons, Supernatural has never been hotter and it’s already been renewed for season five. So why do the show’s stars and creator want to call it quits? 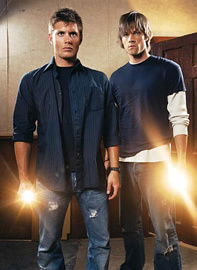 Created by Eric Kripke, Supernatural revolves around the Winchester brothers and their ongoing battle against demons, and any other hellion you can think of. Older brother Dean (Jensen Ackles) followed in the footsteps of his demon-hunting father (Jeffrey Dean Morgan) while Sam (Jared Padalecki) tried to make a break from the family business and lead a normal life. When Sam’s girlfriend is killed in a similar manner as his mother and the brothers’ dad disappears, the good-looking heroes set out on a crusade of their own. Recurring characters are played by Jim Beaver, Genevieve Cortese, Misha Collins, Katie Cassidy, Lauren Cohan, Samantha Ferris, Julie McNiven, Nicki Aycox, Alona Tal, Samantha Smith, Sterling K. Brown, Chad Lindberg, Robert Wisdom, Charles Malik Whitfield, Adrianne Palicki, Fredric Lehne, and Colin Ford. Would you watch Supernatural without Ackles or Padalecki? Maybe. I'd keep an open mind. If that were to happen, Supernatural might have to shift focus to Bobby, a demon, the angels, or some new characters. The contracts for Kripke, Ackles, and Padalecki all expire after next season and the actors aren’t planning to stay either. While last week’s episode culminated in a huge fight between the two brothers, you can expect next season’s finale to be even bigger. Kripke is planning to end it all with the battle to end all battles, one between heaven and hell. Ironically, that little fight sounds about as hard as it’s going to be to get a sixth season of Supernatural.